Weave Magazine: POETSBURGH @ Nationality Rooms! Open Thread and Weave Magazine are back with another edition of POETSBURGH! Come hear Tom Laskow, Molly Prosser, Dan Shapiro, and Michelle Stoner share some of their latest work! 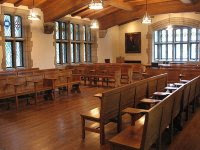 It's all going down in the fabulous English Nationality Room, the largest of those famed spaces in the Cathedral of Learning! Doors open promptly at 7pm. $5 suggested donation.